Israeli Prime Minister Benjamin Netanyahu firmly ordered his government not to comment on events in Egypt, but the headlines in the Sunday morning papers got the main point across well enough: "A 30-Year Step Backward," "What Frightens Us," "All Alone." The banners matched the stakes. Egypt under President Hosni Mubarak observed the 1979 peace treaty with the Jewish state, helped put pressure on Hamas from Egypt's border with the Gaza Strip, nursed peace talks with the Palestinians, worked to thwart Iran and along the way provided Israel with 40% of its natural gas. Most important to a tiny, heavily militarized country preoccupied with risk reduction, analysts say, Mubarak's posture toward Israel served to restrain other Arab states  not to mention the 80 million Egyptians whose attitudes about Israel are among the most negative in the world, according to polls. Whatever new government might emerge from the historic demonstrations across Egypt  populist, Islamist or national unity  "there can be no doubt that the new regime will seek to deal the peace with Israel a very public blow," Eli Shaked, a former Israeli ambassador to Egypt, writes in the daily Yedioth Ahronoth. 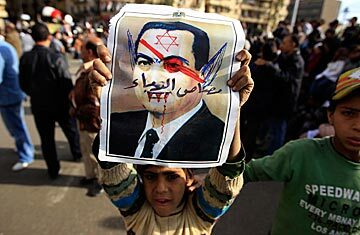 "The only people in Egypt who are committed to peace are the people in Mubarak's inner circle." So that was why Israelis welcomed Mubarak's appointment of intelligence chief Omar Suleiman as his first-ever Vice President. The mustachioed spymaster and former general was a regular visitor to Israel, where he consulted with Israeli defense and intelligence officials on the many issues the two countries held in common in what may have been a "cold peace," but one that has lasted three decades. "Egypt and Israel had common strategic interests. To say they were allies is too much: they were not at war," says Shlomo Avineri, a political scientist at Hebrew University. "It is the premier Arab country, and no other country would go to war without Egypt. So there was a substructure of common strategic interest." Avineri, who held a senior position in the Foreign Ministry of Yitzhak Rabin, describes two possibilities: military rule, with or without Mubarak as figurehead, or "chaos and disintegration" that ends with rule by Islamists and nationalists descended from Gamal Abdel Nasser, Egypt's second President. Israelis most dread the ascent of the Muslim Brotherhood, the most organized political opposition in Egypt, which like other Arab societies has grown more religious and conservative in recent decades. "What will not come to pass is that Israel will have a democratic neighbor, because democracies don't appear overnight," Avineri tells TIME. "Look at Russia. You need a civil society. You need political tradition, pluralism, tolerance, existence of effective parties." Israeli press reports described a weekend of frantic meetings in the upper echelons of government. The Israeli Defense Forces, which have concentrated most of their attention on the borders with Lebanon and Gaza, were described as preparing new deployments to the south, where Israel fought wars with Egypt four times. U.S. diplomatic cables published by WikiLeaks last year included diplomats' complaints that the Egyptian military continued to regard Israel as its principal enemy and prepared for war in the Sinai Desert, which lies between them. "I have no doubt that the whole defense establishment will now ask for bigger budgets and say, 'Well, we have to adjust ourselves to a situation where Egypt is not the cooperative partner we had until a week ago,'" says Oded Eran, director of the Institute for National Security Studies, a Tel Aviv think tank brimming with retired generals. "Egypt is sort of the beacon or marker for security tension, for dangers with the Arab world." No one pretends to know the implications. After Egypt signed a peace treaty, Jordan followed, then the Palestine Liberation Organization. In time, the Arab League went from calling for war with Israel to formulating a 2002 plan to end the Israeli-Palestinian conflict with two states. But from the Israeli perspective, some of the dangers are immediate. Al-Jazeera aired an interview with an Islamic militant who in the chaos of the past few days had escaped a Cairo jail and made his way back to Gaza, where he pledged to resume attacks on Israel. He said thousands escaped with him. "Yes, we are very, very worried about the situation," says an Israeli general. The officer spoke privately in observance of the government's order of radio silence, a harm-reduction measure Netanyahu reaffirmed in brief remarks to reporters before Sunday's regular Cabinet meeting. He had spoken with both President Barack Obama and Secretary of State Hillary Clinton overnight. "At this time, we must show responsibility and restraint and maximum consideration," the Prime Minister said. "The peace between Israel and Egypt has lasted for more than three decades and our objective is to ensure that these relations will continue to exist." See President Obama's response to the turmoil in Egypt.